Two ASD employees and two teams of colleagues are recipients of the Denali Award, a biannual recognition program which honors employees who have shown outstanding achievement, service, and dedication in ensuring every student has the opportunity to achieve his or her potential. Adored by her peers and students alike, Romig Middle School and West High School Librarian Staci Cox’s commitment extends beyond the classroom and the school day. She is described by her principal as passionate and dedicated to student success and lifelong achievement. Ms. Cox serves over 2500 students between the two schools with diverse needs, from students in Spanish and Russian Immersion programs to West High students in the International Baccalaureate Program. In addition to her daily tasks in the library, Ms. Cox works behind the scenes training student aides and teachers to use equipment and seeks out additional funding for student resources. She designed and aligned West’s and Romig’s websites and was recently recognized for her work on West’s homepage. She also works on the BaseCamp Committee’s Google Drive keeping the calendar, schedule, and lessons updated in order to ease the load of teachers with homeroom lesson planning and prep. “It is my honor to nominate Ms. Staci Cox for the Denali Award, which celebrates everything Ms. Cox emulates, including outstanding achievement, service, and dedication and ensuring every student has the opportunity to achieve his/her potential,” said her principal. 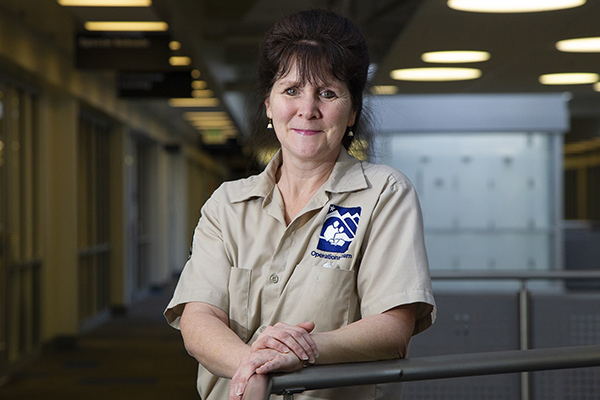 Well-known for her smile and her attention to detail when working, Wendy Pryor, Building Plant Operator at the Education Center, has been nominated for her strong work ethic and devotion to her responsibilities. Her day begins at 6:15 a.m. when she opens the Ed Center for over 200 employees who work in the building. Her supervisor notes that Wendy has never been late during the two years she has worked at the Ed Center. Prior to her work at the Ed Center, Wendy has been a BPO in various schools since 2001. Wendy’s work enables the District to achieve a positive first impression when community members arrive to the building. Wendy recently was thanked publicly with a Quyana-an Alaskan thank you-for her service to the Ed Center and how her outstanding work is always complemented with a smile. Wendy has a gracious and kind spirit that makes her a joy to work with. She is cheery and pleasant on a daily basis with a warm and inviting demeanor. Beyond her responsibilities of cleaning and building upkeep, Wendy supports the many employees in the building with recycling, minor repairs, assisting with office/desk moves, and more. She is also accountable for the set up requirements for the use of the Ed Center Boardrooms and Atrium—ensuring the areas are set up to accommodate the needs of the many users of each space. The behind-the-scenes team of two System Analysts-Kim Vierra and Dmitry Korobov and Teacher Expert John Oliver in the Special Education Department, is recognized for their seamless collaboration as a team to support ASD staff members. Each member of this team is labeled by their supervisors as exceptional professionals and integral to the District with their technical support knowledge and their high level of customer service to the special education department. John Oliver single-handedly manages the special education help desk, providing timely and effective customer service support to almost 600 certified special education staff, plus administrators, and other staff as needed. Dmitry and Kim provide equally dedicated services behind the scenes. They are instrumental in providing technical support to the special education department-not only having developed and supported the foundational program of PowerSchool, but also supporting the many additions, tweaks, and adjustments within the program that have been requested by Special Education. The SpED Tech Team has been extremely effective with their efforts to expand the possibilities for the Special Education Department and others like Gifted, Migrant Education, and AEL. In PowerSchool, they have created reports and other system enhancements that improve reporting, accountability, and operational efficiency. Respected and admired by their peers and their students, Fire Lake Elementary Resource Teacher, Susan Ortiz and Teacher’s Aide Kelly Holt are known for their devotion and compassion for students. Both women are described by their principal as two individuals who are a true team, working together seamlessly providing support behind the scenes to teachers and moving between classrooms checking on their students and building strong positive relationships. Outside of their normal duties as the special education teacher and TA for the intermediate students at Fire Lake, Susan and Kelly can be found in their room during lunch time so they are easily accessible for students that struggle during lunch and recess. Their “open door” policy has accredited them as genuine in their compassion for their students’ needs and allows them to be more flexible when brainstorming new ways to help each child be more successful. Not only are they incredibly supportive and encouraging to their students, but they have proven they are invaluable to each staff member who has been able to work with them.